Former President Barack Obama said that more women need to be in positions of power because "men seem to be having some problems these days." Obama was speaking at an invitation-only event called "Les Napoleons" to a group of media, finance and academic professionals while spending time in Paris over the weekend. "Not to generalize, but women seem to have a better capacity than men do, partly because of their socialization," Obama said. The 44th President did not call out any of the powerful men across politics, media and entertainment who have been accused of sexual harassment this year, but did speak to "the importance of more focus on putting women in power." Obama’s statement was his response to a question about leadership qualities. He said that he appreciates people who question themselves and others. "How can I make the people around me better?" he said. "How do I empower them... how do I build a team where everyone's pulling together to get something done?" 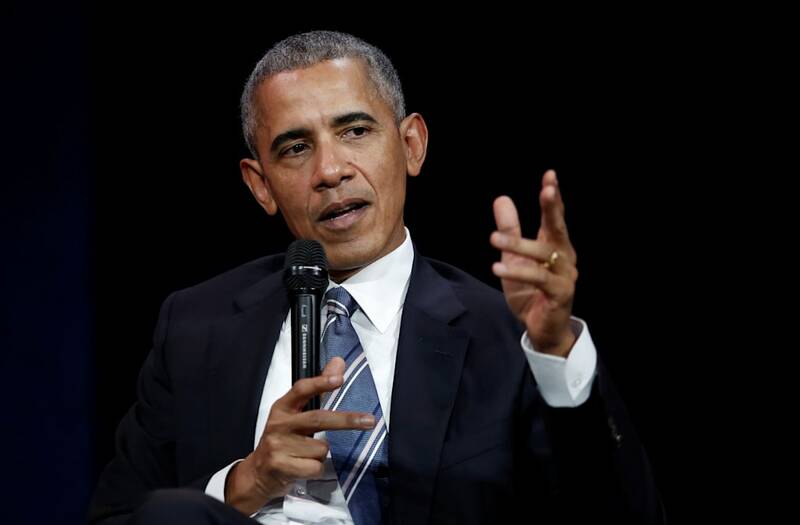 Obama also took a quick jab at current President Trump, saying there was a "temporary absence of American leadership" when the new administration announced earlier this year it would pull out of the Paris climate accord. "But despite that," Obama said, "you're seeing American companies and states and cities continuing to work on this issue."